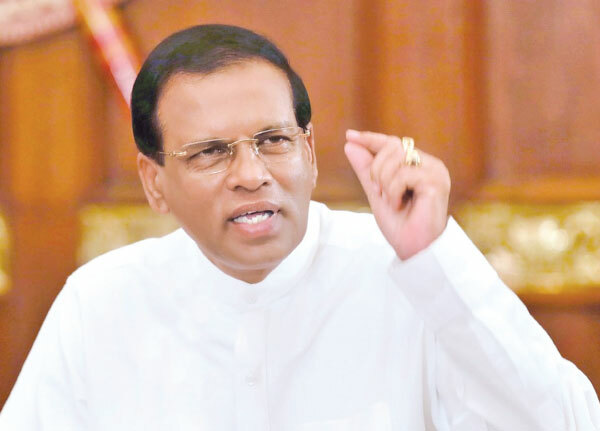 With a three-way race for the local government polls well underway, actually a five-party race if one considers the official opposition JVP and the TNA as well, President Sirisena at a political rally late last week in Kosgama, called on the people to prevent a return to the past. He urged the people to not leave room for the return of white vans, fear, humiliation and ethnic disharmony. When Sri Lanka was fast becoming a near pariah state on the world stage and where rampant corruption by the kith and kin of the ruling elite was the order of the day. He urged people to use their vote wisely to prevent a return to such a past. In the course of the campaign for the LG elections, in the run up to the same and before then, the Rajapaksa’s nor their surrogates the SLPP or their allies in the Joint Opposition (JO) have never acknowledged the errors, faults and shortcomings of the Rajapaksa Administration, especially during its second term. There has been no regret mentioned at all for sacking a Chief Justice, jailing a presidential election opponent, victimizing the war time Army Commander, permitting newspaper editors to be murdered in broad daylight, seeing mosques burnt and Muslim businesses attacked, appalling human rights violations, economic mismanagement, taking on crippling debt and rampant corruption. While it should be conceded that in our cultural ethos, at least for a majority of people, the concept of repentance saying “mea culpa” or my fault is alien and a loss of face, a candid acknowledgement of error and a commitment to a new path is not politically uncommon and is actually required. When the SLFP in 1994, returned from a seventeen-year political wilderness in the opposition, under the leadership of Chandrika Kumaratunga, there was a clear break from the disastrous and failed socialist policies of the 1970-77 period and commitment to a managed free market economy. The UNP has radically moved away from its disastrous approach to ethnic relations which witnessed the fiasco of the District Development Council (DDC) elections of 1982, the resultant burning of the Jaffna public library and the 1983 anti-Tamil riots under their watch. Even the JVP, counter ideologically has renounced armed revolution, which it had twice waged both in 1971 and 1988/89 as a means of bringing in socialism and most crucially for national reconciliation and social cohesion, the TNA used the destruction of the LTTE’s entire senior military leadership to renounce both separatism and the armed struggle, committing instead to a robust democratic political engagement with the Sinhala polity. In contrast, the only political force to have expressed no regrets, remorse or a commitment to a political course correction are the Rajapaksas, their fellow travellers of the Joint Opposition and their political surrogates in the SLPP. The Rajapaksa political project seems intent on taking Sri Lanka back to a darker past, the contours of which we can all remember and President Sirisena urges us never to return to. A serious Rajapaksa return will require a reexamination of what went wrong, especially in its second term, candidly admitting the same and committing very publicly to never repeat its dark, disastrous and corrupt track record. Paradoxically it may require a new, younger generation leadership, like young Namal to be the standard bearer for the “kurakkan shawl” rather than either brother number one or brother number two (no pun intended). The issue of succession within the Rajapaksa family is the issue which clearly remains unresolved, demonstrated most recently by the departure from Sri Lanka of Gotabhaya Rajapaksa and his decision to sit out the LG election in the United States. His political organisation “Eliya” and its associates have become totally silent and are not active in support of the SLPP pohottuwa. The Rajapaksa top echelon has divergent interests, which work against a quick return to power. Mahinda is constitutionally barred from seeking election as president, son Namal requires time to build himself up as a national leader with broad acceptance, Basil has too many political enemies from his decade as Mahinda’s political hitman and henchman and Gotabhaya is a polarizing figure, with no experience in politics, a military mindset unsuited to democratic governance together with a complete lack of understanding that compromise can lead to consensus and is anathema to the Muslims who comprise 10% of the electorate. These are significant drawbacks, not helped in any way that their political allies are mono ethnically Sinhala only and comprise such political lightweights as Dinesh Gunawardena, Vasudeva Nanayakkara, Tissa Vitharana, Udaya Gamanpila and Wimal Weerawansa, all leaders of very small political parties, which all except the last, being only capable of electing their leader and no one else to Parliament. One-man parties and the exception of the NFF with five MPs has been imploding of late, with cross overs to President Sirisena’s SLFP. The real story of February 2018 and how it differs from the general election of August 2015 is that overall the national vote but especially the UPFA vote will now be broken up between the SLFP led by President Sirisena and the SLPP led by the Rajapaksa’s. The Rajapaksa’s SLPP’s pohottuwa claims the opposition or political dissent space and the Sinhala nationalism political space, while President Sirisena has the SLFP’s party machinery, the anti-corruption platform and the political moral high ground. Exactly how the UPFA / SLFP vote will split up and how much of the floating vote would swing towards President Sirisena remains to be seen. It is uncharted political territory and we shall know the answer soon enough on February 11th, when the election results are known. Either way as President Sirisena says, we must avoid a return to the past. Will there be no white-vans and more , if Gota forms an alliance with Maithri's SLFP ??? UNP during 1986 to 89 were white van masters. 60,000 Singhalese youths were killed by UNP and JVP. No action was taken against people like Hon. Mr. Ranil (PM) by Madam Chandrika recommened by Batalanda commission due to their personnel friendships even though UNP took away her mothers civil rights. How can our people forget that. Prabakaran is right. we stupid Singhalese memory is only two weeks.